A solid panel made of gypsum plaster with thick paper on both sides. It is used in most modern homes to construct walls and ceilings. Using thicker drywall ot two layers of drywall can help to keep sound from traveling from one room to the next. 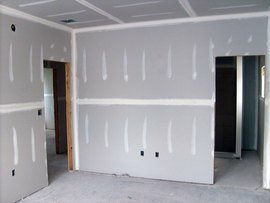 The materials needed for drywall installation are relatively inexpensive. The most expensive part of the job is the labor. A sheet of drywall costs about $9, and the average labor cost for installation is $30 per sheet.